It’s Friday, and after a long week of trudging around in the cold slush thank’s to an early spring snowstorm we’re ready to have some fun with friends. But first we need something light, fresh and smooth to celebrate the launch of the weekend and this cocktail sounded like the perfect answer. Tonight the folks from Madtini are heading downtown to Tequila Bookworm on Toronto’s Queen Street West to enjoy the tight grooves and rockin’ beats of Abdul Smooth and Nathan Lee, who make up the music project called People Downtown. They are hosting The Media Social, a monthly meetup for media professionals to get together, discuss their work and encourage continued collaboration. If you’re in the Toronto area drop by, hang out and say hello. Carve a spear from an English cucumber to be used later for a garnish. Peel the rest of the cucumber, scrape out the seeds, then cut into it into small chunks. Add the cucumber chunks to a food processor and puree until smooth. Strain the contents through a fine sieve or cheesecloth, squeezing as much liquid out as possible. Add the sugar, mint leaves, lime juice in a cocktail shaker filled with ice. 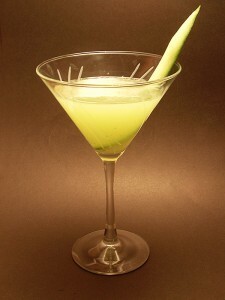 Shake well, then add the cucumber juice, vodka and cointreau. Shake the combined contents, then strain into a chilled cocktail glass. Add the cucumber spear as a garnish and serve.